Deputy Mayor and Responsible for the Tourism Department, Henrique Tello, considered this results very positively as fruits of the efforts made promoting the city and its main identity icon during the year in which it was awarded as World Heritage. Tello estimates that during this year another important growth is foreseen due to the Xacobeo 2010 and to the activities carried out by the Tourism Department of A Coruña in order to attract visitors to the city. 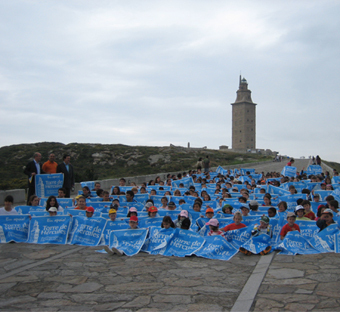 During 2009, the Tower of Hércules held the main role in all the promotion events designed by the Tourism Department of A Coruña. The prominence of the Roman lighthouse in the activities prior to its award as World Heritage, as well as in the subsequent ones to its relevant distinction (the award received in the summer) turned out in an outstanding visitor’s growth. In fact, the growth achieved in 2009 compared to the previous year shows 20.000 more visitors. In 2008 129.966 people paid a visit to the Tower, and in 2009 this figure grew up to 149.440 visitors. Months with higher visitors flow were August (43.1150), followed by July (33.396), September (14.283) and June (13.495). It has to be highlighted as well that the day with highest number of visits to the Tower was the 4th of July, with a total of 2.260 people. That day was the Saturday following the historical day of the awarding of the Tower of Hércules as World Heritage. That day, the 27th of June, 740 people approached the Roman lighthouse to celebrate this event. Deputy Mayor, Henrique Tello, judged these results as very positive, since they show the weight of the Tower among the tourist monuments of the city, along with its significant role as a lure to attract visitors to the city. Besides, he pointed out that this positive balance is only the advance of what is to come. During the current year 2010, in which the Xacobeo is held, it is foreseen a significant visits growth to the Tower. This growth will be the turnover not only to the promotion of Galicia at a tourist level, but also to the promotional activities of A Coruña, and to its main identity symbol. All these events are being carried out by the Tourism Department during this year.